High speed shaking-mixing of ink container inside closed chamber. Vacuum Pump for removing bubbles available in model AT-MIX7V. 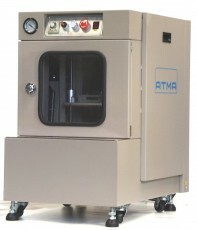 Protective chamber door is equipped with safety lock to halt machine immediately when opened.